Ask Leo! #698 – Do I Need All These Partitions? 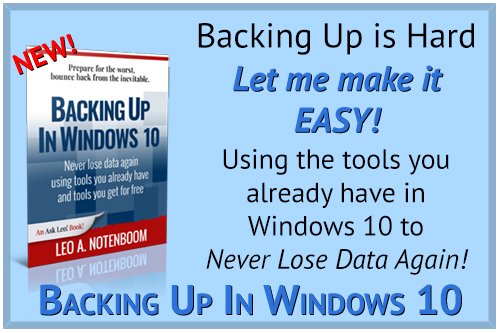 I'm very happy to announce that my most recent book -- Backing Up In Windows 10 -- is now available in paperback on Amazon.com. Hopefully you're aware, but for over three years I've been narrating the Ask Leo! articles published each week. There's an audio player near the bottom of each article where you can listen as I read. The narration is also provided in the form of a podcast you can subscribe to, if that's your preference. I generally record in my makeshift video studio. Someone suggested that I "turn on the camera" even when I'm recording audio and make the result available on YouTube. That started this week and each of the articles includes a "Video Narration" section where you can watch me read (it's not quite as boring as it sounds ) Hopefully this will also help people looking for answers on YouTube find Ask Leo! as well. You'll find the videos near the bottom of each article, and on my YouTube channel. Also: CPU Hogs, and the safety (or not) of online document conversion. Is it possible to remove some of the Recovery Partitions from my SSD laptop? I think some of these partitions are not needed but I don't know which ones. If they can be deleted, how would I add that space to my C: drive? Yes, you can delete partitions, but no, I would not advise it. As you say, you don't know what the partitions are, so you don't know whether or not they're needed. It'd be a shame to delete one and find out later that this was a serious mistake. It's the result of several changes over the years, including UEFI, the disappearance of installation media, and more. The EFI partition is required by UEFI/GPT formatted hard drives. It's what the machine boots into when first started. Confusingly, this is often referred to as the “System” partition, even though it's not the system you and I might think of. The C: partition is obvious: that's the hard disk you see and use when you're running Windows. This is what I tend to think of as the “system” partition or drive, since it contains my system (Windows), as well as all my applications and data. It's by far the largest partition on the drive. I also suspect that recovery partitions are extremely manufacturer-dependent. What I see on my machine will be different than what you see on yours. Even the content of these partitions varies dramatically based on the decisions made by your computer's manufacturer. If you want to remove partitions, it's important to realize that you're trading off the reasons for the layout — whatever those reasons were — for a small increase in disk space. My example machine above is already fairly old, with a comparatively small hard disk. Even if I did delete all the partitions other than the required EFI partition and the C: partition, I'd be recovering only 8.5GB at best, an increase of less than 8%. Given that today's hard drives are larger while the sizes of the reserved partitions haven't increased proportionately, you're likely to get even less of an increase. In my mind, it just isn't worth it. I'd much prefer to have the recovery options available to me should I ever need them. Then delete the partitions. If you're going this far, I'd be tempted to delete all the “recovery” partitions with the knowledge that should your system need recovery, you'll need to do it some other way. Typically, that means booting from a manufacturer-supplied recovery disc, system disc, or USB stick, or restoring the backed-up system from the previous step to perform a recovery. Merging the freed-up space can be as simple as using Windows' own built-in disk manager, or it may require a partition-management tool to combine the freed-up space. Related Links & Comments: Do I Need All These Partitions? My machine is slower than molasses in the winter time. I suspect that one or more programs are simply using up all of the available CPU time. How do I tell which ones they might be so that I can turn them off, or whatever? It happens to me from time to time as well. A program decides it has something very, very important to do and uses all the computer's processing power to do it. The good news is it's pretty easy to find out which program that might be. Continue Reading: How Do I Find Out What Program Is Using All My CPU? Continue Reading: Is Online Document Conversion Safe?